Your jobsite and commute require proven performance, capable handling, and interior comforts. The all-new Chevy Silverado 1500 and 2019 Ford F-150 go above and beyond, offering these abilities and more to simplify your daily routine. The experts at Mike Anderson Chevrolet of Merrillville near Gary, IN, compared these light duty pickups below to make your decision easy. Explore our extensive Silverado 1500 inventory to find the full-size truck for you or learn more about the 2019 Chevy Silverado 1500 in our model research hub. If you have any questions about the 2019 Chevy Silverado 1500 and Ford F-150 differences, please contact a Mike Anderson Chevrolet representative at (219) 947-4151 or fill out our online form. For the purposes of this comparison, we’ll be looking at the 2019 Chevy Silverado 1500 LTZ, starting at $44,495 MSRP, and the 2019 Ford F-150 LARIAT, starting at $41,700 MSRP. There’s no question that the 2019 Chevy Silverado 1500 and Ford F-150 are both extremely powerful, light duty trucks. Built on legendary durability, these pickups feature enhanced aerodynamics and offer comparable engine configurations and drivetrain options. View available standard engine specifications for the all-new Chevy 1500 and Ford F-150 in the table below. 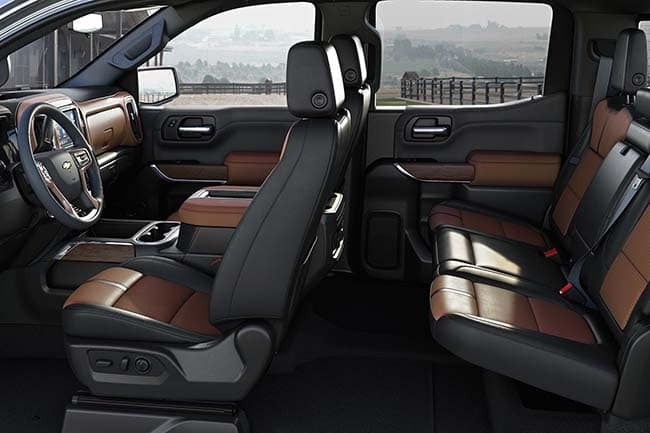 Kick back and unwind in the quiet and comfortable cabin of the 2019 Chevy Silverado 1500. While the Ford F-150 offers thoughtful appointments, nothing can compare to the spacious amenities of this full-size pickup. Browse interior amenities only available in the 2019 Chevy Silverado 1500 below. 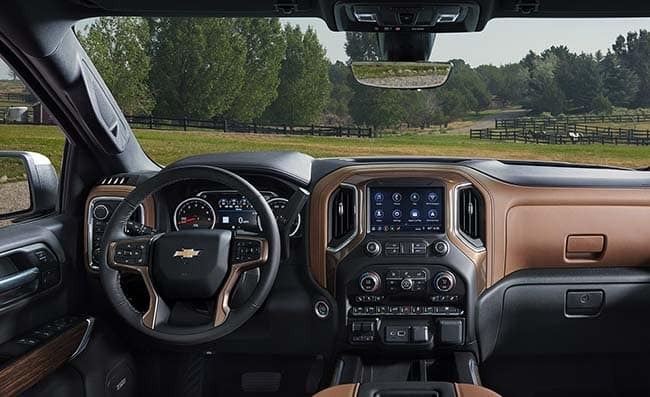 Packed with tech to impress, the 2019 Chevy Silverado 1500 and Ford F-150 have advanced features to keep you connected, no matter which road you’re on. These light duty pickups are both Wi-Fi® hotspot capable and offer game-changing automatic engine start-stop technology and hitch assist systems. Explore a sampling of the high-tech features with the all-new Chevy Silverado 1500 below. Be confident every time you get behind the wheel of the 2019 Chevy Silverado 1500 or Ford F-150. These safe trucks are more reliable than ever with the Chevrolet StabiliTrak® and Ford AdvanceTrac® traction control systems, respectively. 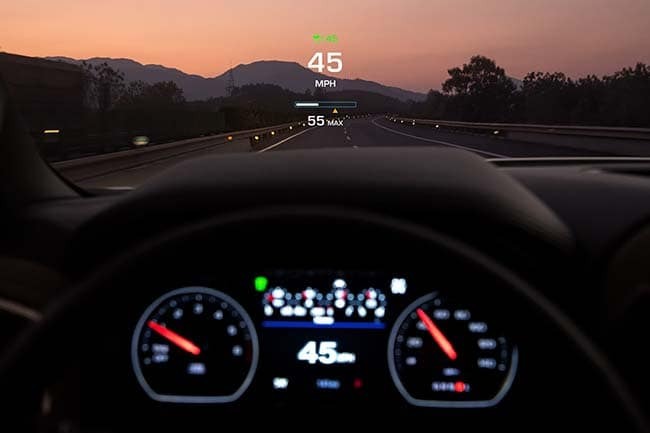 View advanced safety features available with the 2019 Chevy Silverado 1500 below. Are you ready to explore your possibilities? Browse our 2019 Chevy Silverado 1500 inventory at Mike Anderson Chevrolet of Merrillville near Gary, IN, to find the Silverado trim for you, then schedule a test drive to experience this powerful full-size truck for yourself. To learn more about the Chevy Silverado 1500 versus Ford F-150, get in touch with a Mike Anderson Chevrolet specialist by calling (219) 947-4151 or fill out our online form.